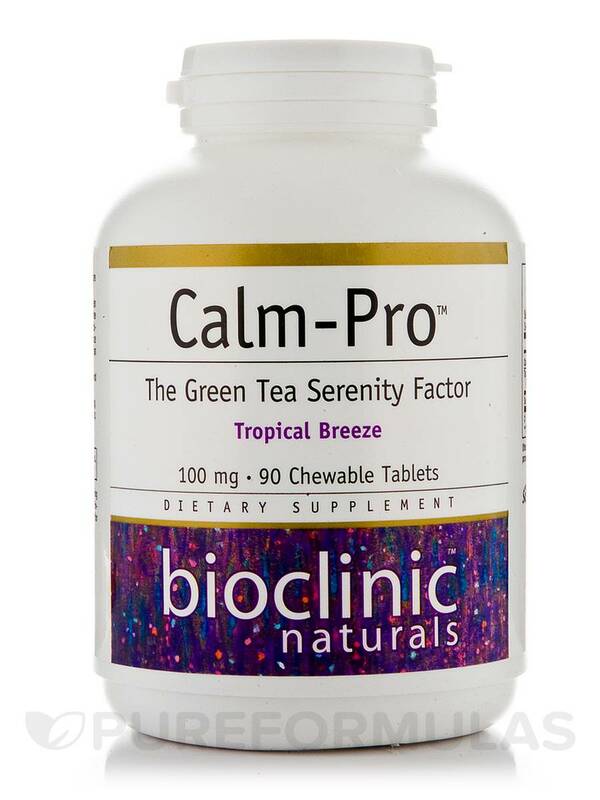 If you’re looking for a supplement that could potentially work to alleviate certain symptoms associated with mild anxiety‚ you might want to try Calm-Pro 100 mg Chewable Tablets by Bioclinic Naturals. 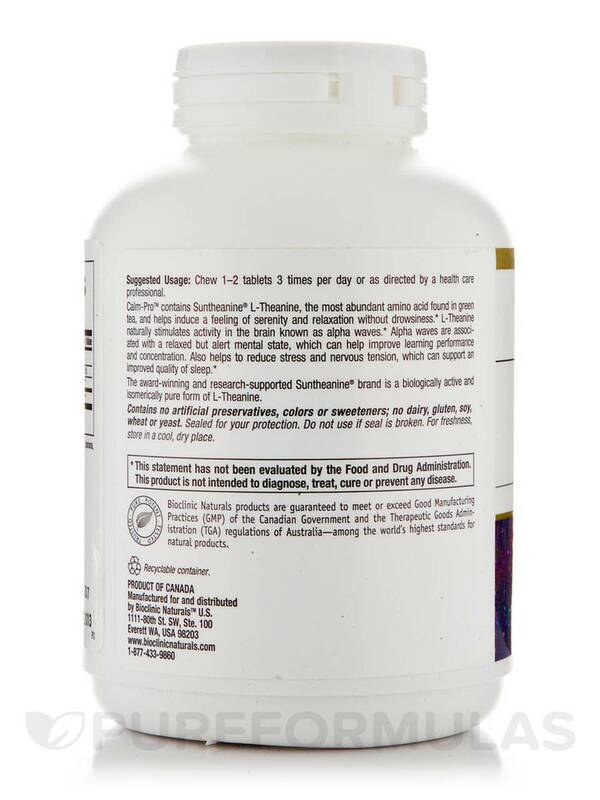 This product contains Suntheanine®‚ which is a unique form of the amino acid L-theanine. Notably‚ L-theanine—which is commonly found in tea—may act to promote a sense of relaxation. In particular‚ the L-theanine in Calm-Pro 100 mg Chewable Tablets may work to boost your brain’s levels of GABA‚ serotonin‚ and dopamine. Dopamine and serotonin are neurotransmitters that can play key roles in managing your body’s response to stress‚ while GABA (gamma-aminobutyric acid) is an inhibitory neurotransmitter that may have a gentle calming effect due to its potential to slow down nerve transmission. Finally‚ Calm-Pro 100 mg Chewable Tablets might work to improve sleep quality‚ which might help you feel more refreshed when you wake up in the morning. Chew one or two tablets three times daily. Each 90-tablet bottle of Bioclinic Naturals’ Calm-Pro 100 mg Chewable Tablets should last from 15 days to one month at the standard dosage. Other Ingredients: Organic cane juice‚ xylitol‚ stearic acid‚ silica‚ natural fruit flavor (pineapple‚ banana‚ pomegranate‚ mango and passion fruit)‚ citric acid‚ magnesium stearate (vegetable grade). Product contains no: artificial colors or sweeteners; no gluten‚ soy‚ wheat or yeast. 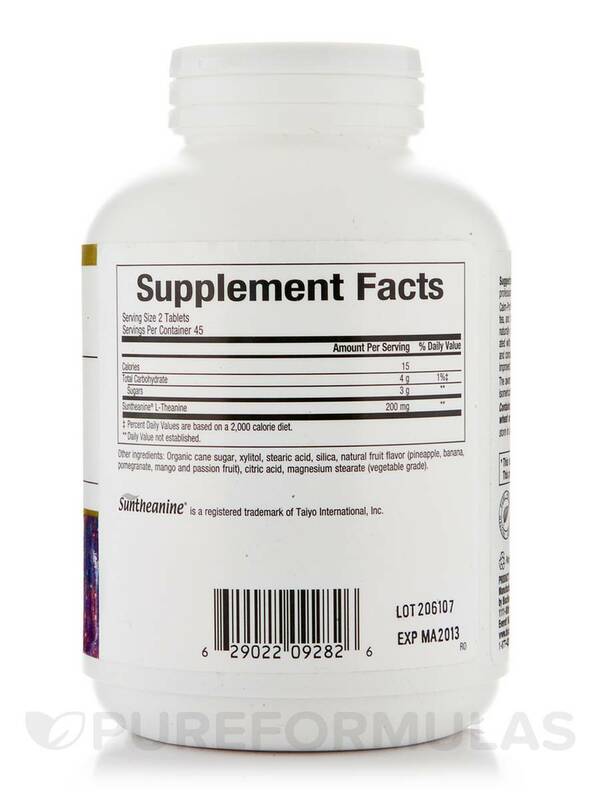 Chew 1–2 tablets 3 times per day or as directed by a health care professional. While no specific contraindications exist or are predicted‚ data is lacking for use during pregnancy‚ lactation‚ and in children‚ and the dosage may need to be reduced for those less than 18.